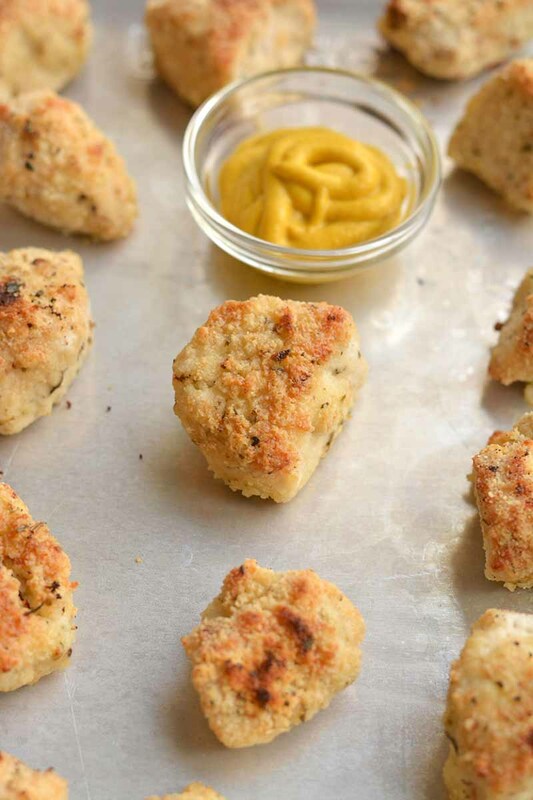 What if I told you that you could recreate the classic flavor of chicken nuggets in the convenience of your own kitchen with just a few easy-to-find ingredients? Even better, the Healthy Homemade Chicken Nuggets will be full of flavor, low in carbs, and taste really, REALLY good! I know it sounds a bit too good to be true, but it’s not. I have to admit that ever since I created this Healthy Homemade Chicken Nuggets recipe, I’ve made them at least once a week. It’s kind of hard not to when they taste as good as they do! 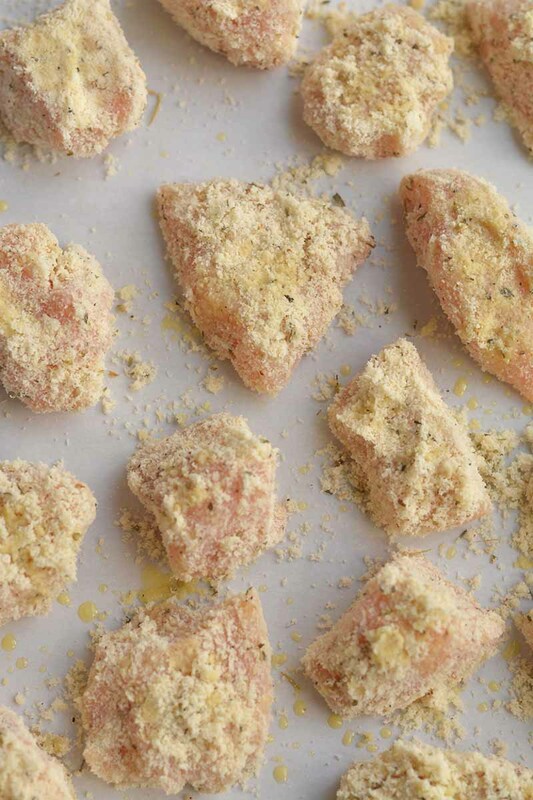 I especially love that they contain only six ingredients (chicken breasts, almond flour, Italian seasoning, extra virgin olive oil, salt, and pepper) and they’re all wholesome ingredients. No fillers, additives, or artificial flavorings! I don’t know if you’ve seen the ingredients list for some of the popular chicken nuggets out there, but they’re scary! The chicken nuggets from a popular fast food restaurant contain a whopping 40 (that’s not a typo!) ingredients – that’s just way too many ingredients for a food that should be so simple. What’s also nice is these chicken nuggets are completely gluten-free since they use almond flour as the breading instead of breadcrumbs. This makes them a great menu choice for those who either have to or choose to avoid gluten in their diet. Who knew chicken nuggets could be such a perfect food choice for so many people? 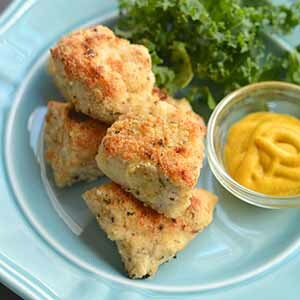 While they may not be as fast as pulling up to a drive-through window, these healthy chicken nuggets are ready in just about 40 minutes! 15 minutes of prep time, 20 minutes in the oven, and then a few minutes under the broiler to make them nice and crispy just like chicken nuggets should be. Step 1: Stir together the almond flour, Italian seasoning, salt, and pepper. Don’t hold back on the seasoning, you want the chicken nuggets to have a lot of flavor. Step 2: Cut the chicken breast into 1-inch think pieces and spray them lightly with olive oil (you can also use coconut oil if you prefer). 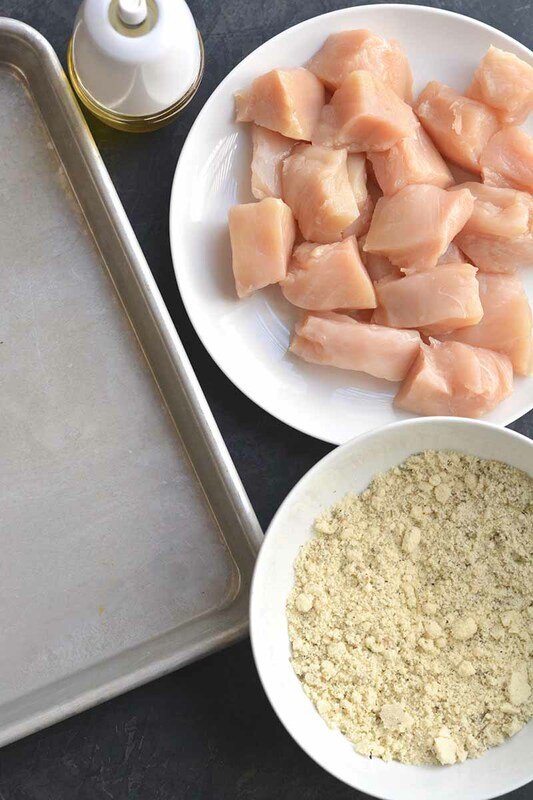 Step 3: Coat the chicken nuggets in the seasoned almond flour and transfer them to a baking sheet. Step 4: Bake at 400 F (200 C) for 20 minutes, then turn the broiler on and place the nuggets under the broiler for 3-4 minutes to make the outside crispy. What to serve with the healthy chicken nuggets? 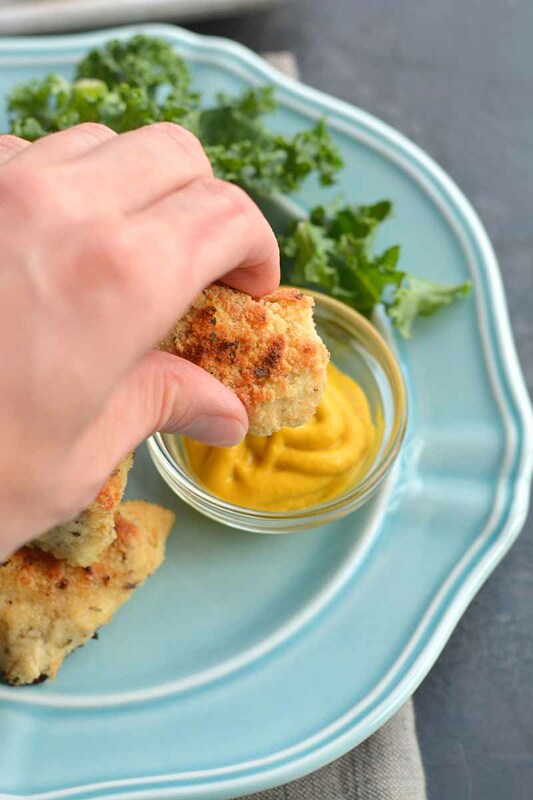 If you’ve been conditioned to think of chicken nuggets as a not-so-great food choice, it’s a little tough to think of them as the basis for a wholesome, healthy meal – but Homemade Chicken Nuggets are just that! They taste great dipped in mustard or hot sauce, both of which are excellent low-carb condiment choices. Avocado oil mayonnaise is another great low-carb choice! I don’t know about you, but I’m ready to dig into some Healthy Homemade Chicken Nuggets. I hope you enjoy the recipe! 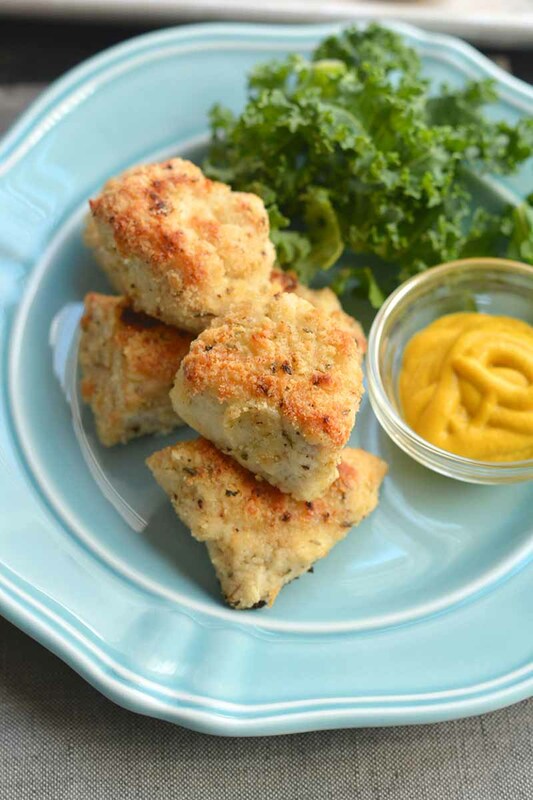 When you’ve tried the Healthy Homemade Chicken Nuggets, please don’t forget to let me know how you liked them and rate the recipe in the comments below! These Healthy Homemade Chicken Nuggets taste so great you won’t believe they’re actually good for you! They’re low-carb, grain-free, and contain only six ingredients. Preheat oven to 400 F (200 C). Prepare a large baking sheet with parchment paper. In a bowl, stir together the almond flour, Italian seasoning, salt, and pepper. Cut any remaining fat off the chicken breasts and discard. Then slice into 1-inch thick pieces. Spray the chicken slices with the extra virgin olive oil. Place each piece into the bowl with the flour and cover liberally. Then transfer to the prepared baking sheet. Bake for 20 minutes, then turn the broiler on and place under the broiler 3-4 minutes to make the outside crispy. Serve immediately with mustard or hot sauce. Just found this site & I am a Type II diabetic & will be looking at other recipes. Can these nuggets be frozen & reheated? Would it be better to freeze before cooking or could they be cooked & frozen for reheating later? Our granddaughter loves chicken nuggets & sometimes they will be from a fast food place with those 40 ingredients or from a bag of frozen nuggets from the grocery. Would like to make ahead & have available when that is one of her choices. Glad you found a recipe you (and hopefully your granddaughter) likes. I haven’t tried freezing them so honestly, I’m not sure. I think I’d cook them before freezing. But I would not cook them all the way through so that when you reheat them they won’t be super dry. Cooked these today with homemade Italian seasoning.